So this is it, I've finally finished with my weekly challenge. It took me more than two weeks to finish my circle quilt, but I think it looks lovely!!! I've tried this video tutorial on how to bind my quilt, which I found very explanatory for a beginner quilter such as myself. Here is how it looks now <3!! For the binding I used a light grey two sided satin ribbon, which I found rather difficult to work with. On my next quilt, I will definitely use a cotton one!! As for the mitered corners, well one of my four I would say that is far from mitered. Mitered corners after all, are not so difficult, but you have to be very tedious and patient to get there. Next step is to wash it to get that wrinkle effect!!! Ooohhh pls don't mind me... I'm in sew heaven!! I can't believe that it is actually finished... now I have to clean the mess I've left behind!! my living room is embarrassingly full of stray threads everywhere..
Time for a new project!!! What a way to start the weekend!! I really like the fabrics you chose for the circles. It's a really fun quilt. Satin binding is harder to handle, but it gives the edge such a nice texture. I love the colors in your quilt. I found your blog from FTLOB today and I'm so excited. I'm going to learn to sew/quilt this year too. In fact, I'm going to pick up my sewing machine from Oregon this weekend and i can't wait to get started! I love the quilt! I have never seen a circle quilt before- so cute. Someday I will lean to quilt. This week I am going to try to make some simple shorts for by one year old, with fun fabric. We will see if it happens. it looks so cozy. I love the umbrellas fabric. GORGEOUS! I made a circle quilt for my baby boy before he was born and to this day it is my favorite style! (You can see it here, if you like: http://www.maybematilda.com/2010/05/striped-circle-quilt.html ) I love your color choices--so beautiful! It is beautiful! Enjoy that "just finished quilt" feeling! It is Beautiful! I love it. 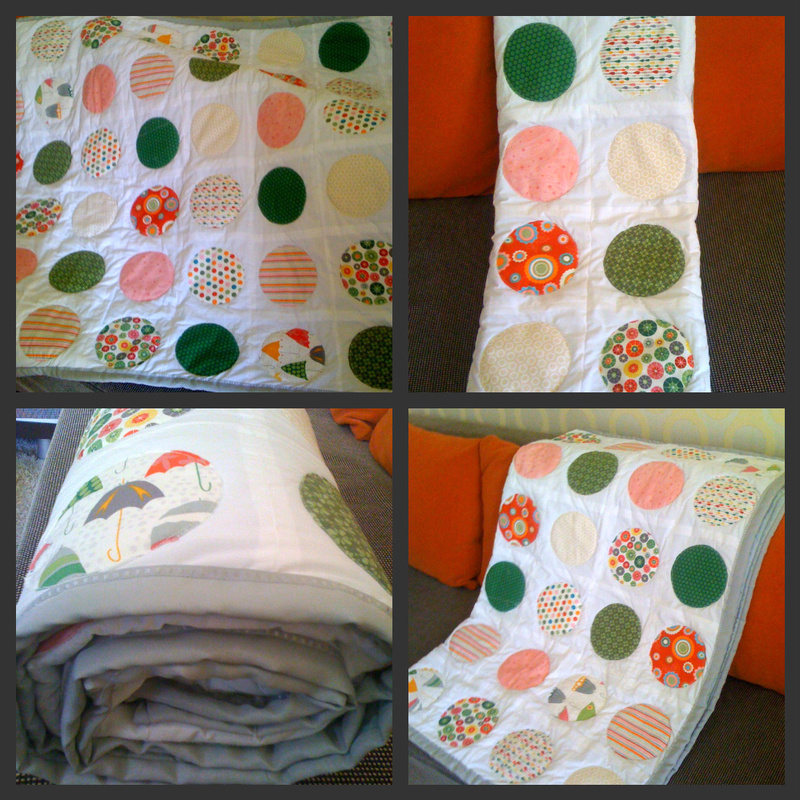 I have been wanting to do one of these circle quilts for one of my boys :) Thanks for coming and linking it up! Way to tackle a quilt! I love the circles, and your color choices were great. I'm your newest follower. Stop by my blog when you have a chance. This would be perfect to share at my new linky party So Sweet Sundays! Very nice quilt. Love all the circles and the colors! Very pretty! I really like the circles. I love to quilt but have not tried a circle quilt yet. Good for you for finishing in two weeks! Congrats on the finish! The circles are so fun and playful in this quilt! Satin binding can definitely be a pain to use! Cotton is much easier to work with. I love the circles, they're so whimsical and fun, great job! Making a circle quilt is definitely on my list! it's awesome! thanks for the video link!! Oh, this is so gorgeous, I love the circles! Pretty Circle Quilt! It's so nice to have a finish! This looks so very awesome! You should be very proud of yourself!! Wow! I love it! It looks like soooo much work, but you did an awesome job! I'm your newest follower. Your quilt is simply beautiful! You definitely inspired me to start planning my first quilt! I'm a new follower - hoping to get some sewing tips from your posts! Would love if you'd visit my blog sometime! Thats lovely! I need to scroll back through to see how it came about! We would love it if you linked up your idea at our What I Made Wednesday Linky Party!! Beautiful circle quilt! I love it! So pretty, I love how cheerful your fabrics look! very nice! I know all about stray threads..I can't even walk into sewing room without them getting on my clothes. I just featured this on my FB page - great job! This is awesome, and you are an incredibly neat quilt maker, your rows are perfect!! I don't know if I could tackle this one,...but I will put you in favs and save it for later!! Awesome, love the umbrella fabric too...where did you get it? circles are so wonderful! this is an amazing finish, well done! You chose great fabric for your circles! This is such a nice quilt! Wow, great job on the circles! Beautiful! I'm here from Quilt Story. I love the circle quilt although I've never made one. I'm more a small-ish creation kind of person. I'd like to see it after it's been washed. Great job!! I'm visiting for Fabric Tuesday. I'd love to have you come by for a visit. I have been wanting to do a circle quilt for a while now. Yours is gorgeous! Visiting from Sew Chatty and a new follower. Beautiful! Thank you so much for sharing this as well! !